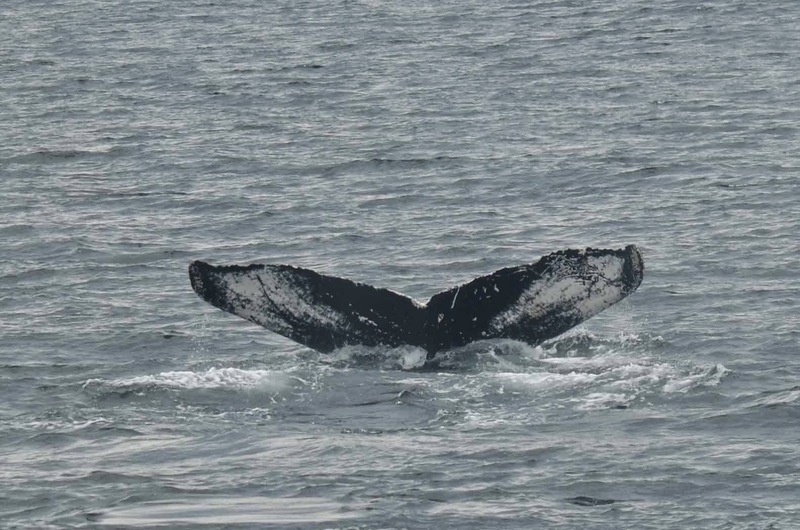 We had absolutely incredible whale watches on board the Asteria yesterday! On our morning trip, we saw upwards of 40 different whales. 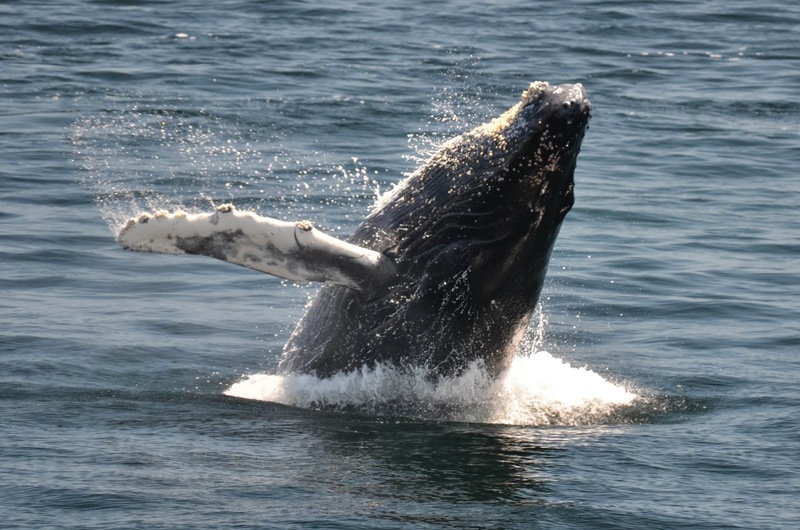 Throughout the whale watch, we saw a total of 6 to 8 fin whales, 4 to 6 minke whales and around 30 humpback whales, not to mention a handful of harbor and gray seals. We were able to ID 24 of these humpback whales including Measles, Dome, Cajun, Grackle, Orbit, Geometry, Daffodil, Pepper, Pleats, Rocker, Weathervane, Eraser, Jabiru, Osprey and mothers Nile, Echo, Glo-stick, Tongs, Milkweed and each of their calves. 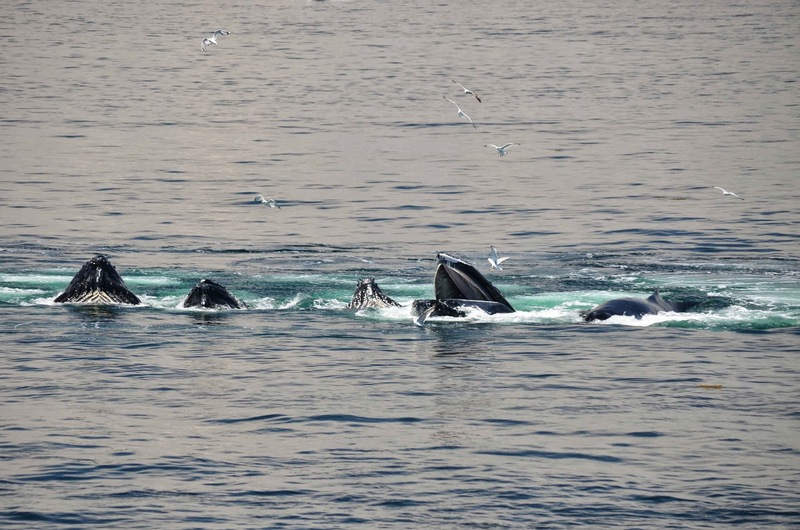 Most of these whales were on the southeast corner of the bank among 4 to 6 feeding groups that were continually joining, separating and changing as they worked the dense bait balls using a variety of feeding strategies! As the moms fed, the calves breached the morning away! 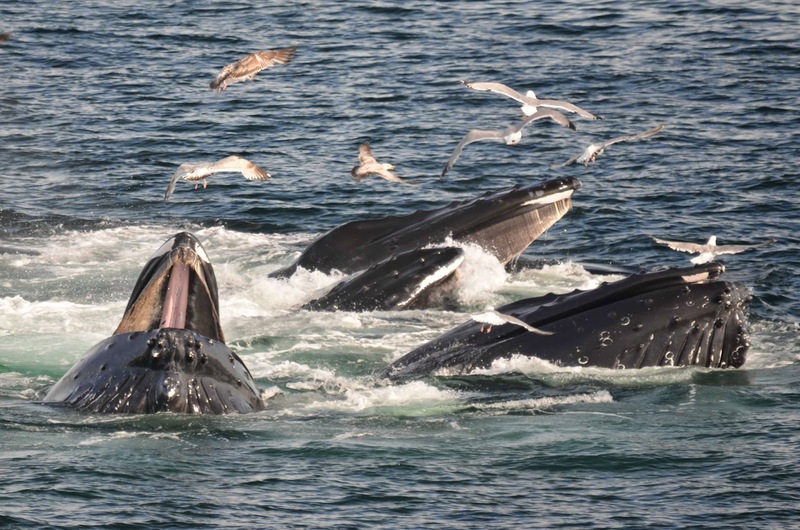 We saw just about every behavior you can possibly see on a humpback feeding ground and it was unbelievable! On the 10 a.m. trip we headed out to the southwest corner. On our way out, we passed a basking shark and a fin whale. The shark was at the surface and the right side of the boat got great looks at it filter feeding. Our fin whale was travelling pretty fast but stayed at the surface for a couple of breaths as we cruised by. 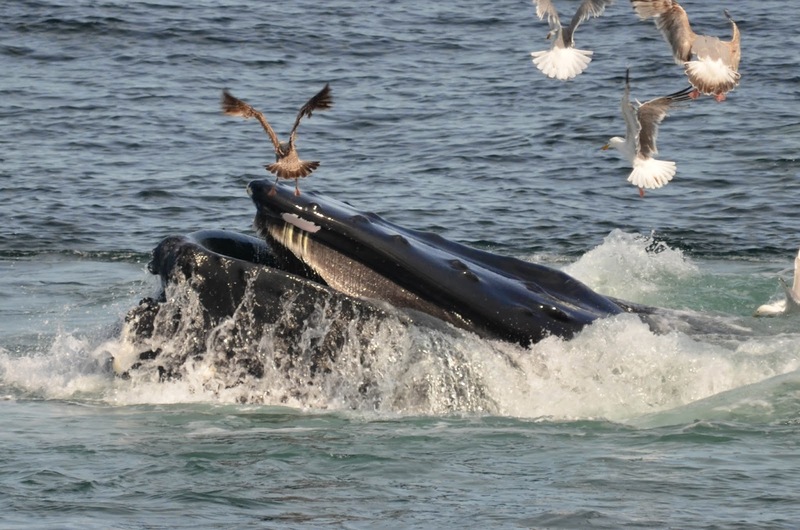 Not long after spotting the fin whale and basking shark we came upon a humpback taking 3-5 minute dives. This whale turned out to be Hancock, a female born in 1991 to Clipper. She was pretty relaxed and spent a few minutes at the surface during each surfacing. She also spent most of her time bubble feeding and doing some very gentle open mouth feeding. We were able to spend about 30 minutes with her during which she repeated the same behaviors over and over. She changed direction frequently and seemed to be chasing some of the bait we were lucky enough to see at the surface. Each time she dove she gave us a beautiful look at her fluke giving passengers some great pictures! On our afternoon trip, the whales were still very active. In addition to scattered fin and minke whales, we saw Dome, Osprey, Jabiru, Pleats, Pepper, Eraser, Geometry, Cajun, Orbit, Weathervane, Measles, and mothers Echo, Glostick and each of their calves. We continued to see some amazing different feeding behaviors including kick feeding, bubblenet feeding and what looked like chin-slap feeding! It is amazing that well into June we are still seeing so many whales on the southern end of the bank! While the large group of whales brought lots of attention from recreational vessels, I was really impressed by how responsibly these vessels were operating around the whales. 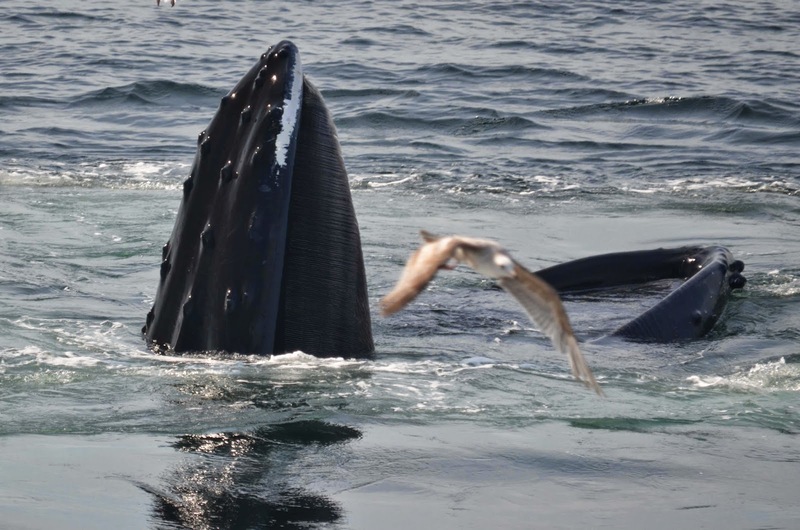 In recent history, this respect for the whales hasn’t always been exhibited by recreational boaters. It was very uplifting to see that there may be a growing awareness among recreational vessels for responsible whale watching.